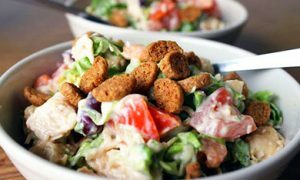 The recipe for salad with beans and croutons: classic and festive variations. 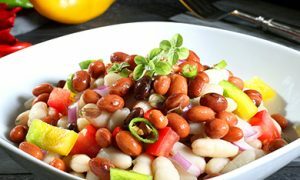 What is useful for beans, what to choose and how to cook properly. Than to fill a dietary variant. Reviews mistresses. 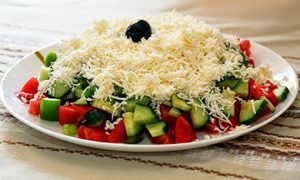 The classic recipe for salad "Tbilisi" step by step. Variation with meat ingredients - chicken, pork, ham, tongue. Lenten decisions with fish and vegetables. What you need for a successful marinade. 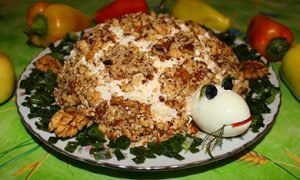 The recipe for the "Turtle" salad is step by step: the order of the layers and the ways of brightly decorated "shell", "head" and "paws". 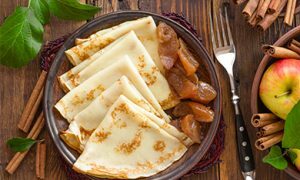 Classic versions with apples and nuts. Species with fish, mushrooms, minced meat and liver, canned. Salad with chicken, prunes and walnuts: step by step recipe layers, interspersed, slides. Than useful snack. Variants with mushrooms, vegetables, cheese. How to cook in tartlets. Classic recipe for salad "French" step by step. How to apply and submit. Variation of the dish with beets and fried potatoes, with mushrooms, with chicken, with sausage and orange, with shrimps. 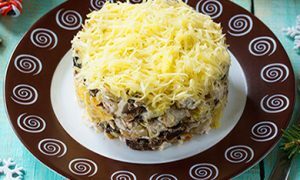 The recipe for salad "Russian Beauty": classic with chicken and varieties with beef heart, mushrooms and prunes. Dietary option. Feed in layers and interspersed. How beautiful to decorate. 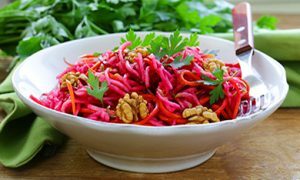 The recipe for the "Brush" salad for weight loss, the benefits and harm of the dish. How to cook a "whisk" with cabbage, celery, prunes and dried apricots. Variants with citruses, bran, chicken. We consume the dish on a fasting day and on a diet. Reviews. 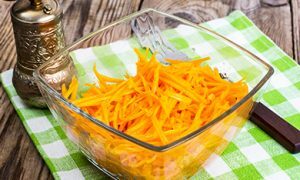 A classic recipe for "Shopska" salad: we select ingredients. We cook as Bulgarians and Serbs. Why and how to serve. Recipe with baked pepper and feta, with chicken and mayonnaise, with mushrooms. 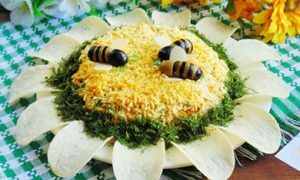 Classic recipe for salad "Sunflower" with chips step by step. 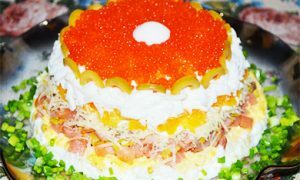 Variants of a dish with a ham, crab sticks, sprats, caviar and sunflower seeds. Recommendations how to make even more delicious and beautiful. The recipe for salad "Gentle": six turn-based options with different ingredients. Cooking with chicken, ham, cheese, crab sticks, fish, vegetables. How to replace mayonnaise and when it is appropriate to add mushrooms. 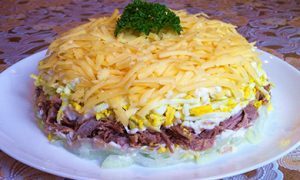 The recipe for the salad is "Male Caprice": classic and five variations. How to process beef and onions. Ways of cooking a dish with chicken, ham, beef tongue, mushrooms and beans. 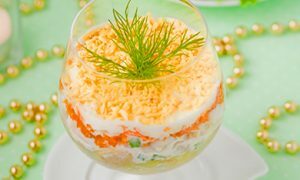 Recipe for salad "Royal": delicacy and budget options. A selection of six simple recipes: cook with crab sticks, croutons, mushrooms and add beets. Three culinary tricks for an unforgettable taste. 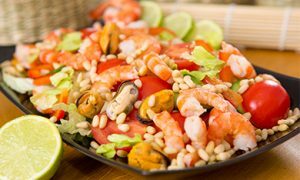 "Sea Pearl" salad: 8 recipes and ideas how to make "shells"
Classic recipe for salad "Pearl" and its variations. Selection of seafood. 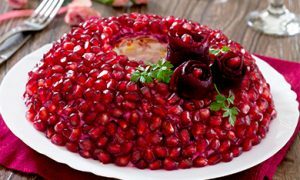 How to cook "Red", "Black", "Sea" and "Mediterranean" pearls. 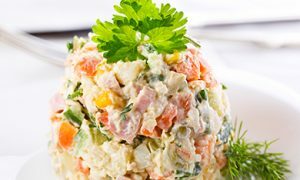 Salad recipes with vegetables, with octopus, with chicken. Ideas for registration. Salad "Little Red Riding Hood", and how to turn it into New Year's Eve in "Santa Claus's Cap"
The recipe for a salad "Little Red Riding Hood": how to make and how to decorate. Festive with smoked chicken and pomegranate. 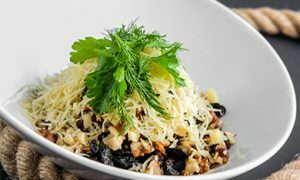 Hearty with mushrooms. Dietary option with Peking cabbage. Spicy with carrots in Korean. Sea with crab sticks.